SyScan Singapore, March. Dmitry Kurbatov: Attacks on telecom operators and mobile subscribers using SS7: from DoS to call interception. Peter Fillmore: Crash & Pay: Owning and Cloning NFC Payment cards. Stefan Esser: iOS 678 Security - A Study in Fail. Black Hat Asia Singapore, March. (IN)SECURITY OF MOBILE BANKING by Eric Filiol & Paul Irolla. ATTACKING SAP MOBILE by Vahagn Vardanyan & Dmitry Chastuhin. DABID: THE POWERFUL INTERACTIVE ANDROID DEBUGGER FOR ANDROID MALWARE ANALYSIS by Jin-hyuk Jung & Jieun Lee. HIDING BEHIND ANDROID RUNTIME (ART) by Paul Sabanal. RELAYING EMV CONTACTLESS TRANSACTIONS USING OFF-THE-SHELF ANDROID DEVICES by Jordi Van den Breekel. RESURRECTING THE READ_LOGS PERMISSION ON SAMSUNG DEVICES by Ryan Johnson & Angelos Stavrou. THE NIGHTMARE BEHIND THE CROSS PLATFORM MOBILE APPS DREAM by Marco Grassi & Sebastian Guerrero. WE CAN STILL CRACK YOU! GENERAL UNPACKING METHOD FOR ANDROID PACKER (NO ROOT) by Yeonung Park. This year's SyScan unfortunatelly is the last one. Very sad to see this conference go away. SyScan was the first industry conference I spoke at! There is a new mobile specific venu Black Hat Mobile Security Summit taking place in London in June. The problem with unpatched bugs in Android continues: Google No Longer Provides Patches for WebView Jelly Bean and Prior. This is really one of the major issues of Android security in my opinion. In 2013 I was working on a system that helps to address this issue. Details can be found here: 1 2. Android Drawer directory of old versions of Android apps. ShmooCon January 2015. Knock Knock: A Survey of iOS Authentication Methods by David Schuetz; There's Waldo! Tracking Users via Mobile Apps by Colby Moore and Patrick Wardle; Tap On, Tap Off: Onscreen Keyboards and Mobile Password Entry by Kristen K. Greene, Joshua Franklin, and John Kelsey. Black Hat Asia March. DABID: THE POWERFUL INTERACTIVE ANDROID DEBUGGER FOR ANDROID MALWARE ANALYSIS by Jin-hyuk Jung & Jieun Lee; HIDING BEHIND ANDROID RUNTIME (ART) by Paul Sabanal; RELAYING EMV CONTACTLESS TRANSACTIONS USING OFF-THE-SHELF ANDROID DEVICES by Jordi Van den Breekel. The Chaos Communication Congress was super fun again (no big surprise!). It was really good to see everybody again at the end of the year. As the congress is getting bigger and bigger every year it is hard to see people more once and I even missed a bunch of you guys! The talks were pretty good this year and I saw quite a few of them. Here a short overview of the mobile related talks that I actually saw live at the conference. Recordings are available: here Slides of most talks are linked in the schedule: here. The SS7 talks were super interesting. I actually only saw 2 of the 3 talks on SS7 but I'll watch the third one once I get home. The summary of all the talks is: once you get access to SS7 you can easily track phones as often shown on TV shows. Commercial products exist to do this via SS7 (but depending on the manufacturer you cannot use it against every country). SS7-based tracking can be implemented in various ways as Karsten Nohl showed. Very interesting is the fact that IMSI Catchers can benefit from SS7 access as it can be used to access to encryption keys. This basically allows building 3G IMSI catchers. Karsten Nohl showed this live on stage (he intercepted a SMS). SS7 access can be used to steal SMS messages by redirecting the delivery path in the HLR. All in all you can conclude that organizations with SS7 access can do a lot of interesting/bad things. 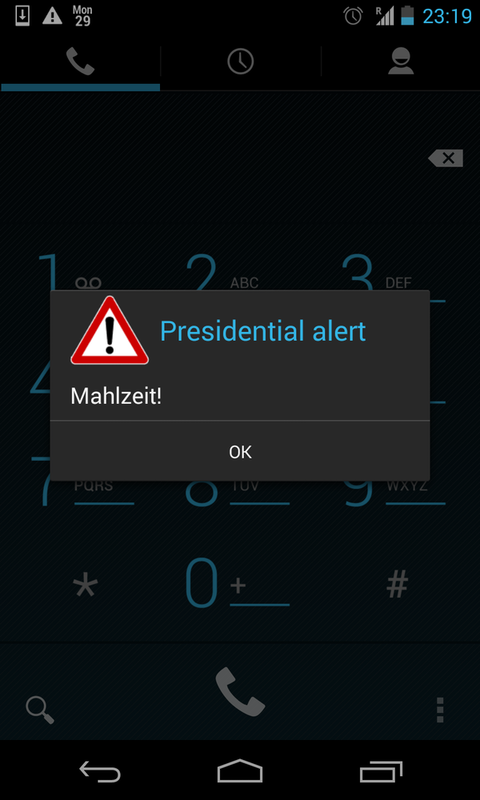 Luckily all the German operators already block many of the security critical SS7 messages from entering their network. SRLabs also released and Android application that analyzes the debug messages from Qualcomm-based phones to determine if your phone is in an unfriendly cellular environment. The tool is called SnoopSnitch. I also really enjoyed the talk from Sylvain Munaut about GMR-based Sat-Phones (specifically the technology used by Thuraya). He presented the progress of the Osmocom project's implementation of an open GMR stack. One interesting detail was that you can break the GMR crypto within 500msec using a known plain text attack against the control traffic. The talk about pagers based on the Iridium satellite network was similar interesting. The presenters build an SDR-based Iridium receiver and sniffed some paging traffic as the satellite beam covers a large region they were able to receive quite a lot of interesting messages. Yes, the traffic is not encrypted! Their code is available here. The guys from @scadasl totally rocked the 31c3 as they also gave a lighting talk on their 4G modem research. No slides unfortunately. The talk Ich sehe, also bin ich ... Du about biometrics vs. cameras by Starbug also looked into smartphone screen reflections in your eye. He showed that you can partially determine what your screen shows and what area you touched with your finger. Verizon's New, Encrypted Calling App Plays Nice With the NSA pre-0wnd encryption, who needs this?